For a lot of women the end of pregnancy is a welcome relief! Dressing a post partum body is not always easy. We need to consider a number of factors to ensure a quick transition back to your pre-pregnancy self. Invest in a good quality belly belt. 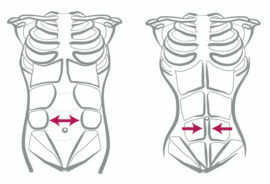 The belly belt is designed to help trim your belly, regain your waist and strengthen muscles. The belly belt works much like a corset, however, it is easier to put on and adjust. It is designed for comfort and can be worn discretely underclothing. It is recommended to wear your belly belt immediately post birth for the best results. Control briefs are a great option after you have finished with the belly belt. They will help to tuck away any extra lumps and bumps, giving you a seam free smooth appearance. Most women will experience some type of leakage in the early stages of breastfeeding. Wet patches around the breast area are not only embarrassing, but can be incredibly inconvenient too, when out and about. Invest in some good quality, absorbent, cotton-nursing pads. These will not only feel great up against your skin but will give you the confidence to get out and about early on. A good well-fitted nursing bra will help to lift and support your heavy bust. Not only will the bra provide you with that much needed comfort but will help to lift your bust into its correct position. A good bra will help to define your waistline giving you a slimmer more defined appearance. We recommend going to get fitted by a bra-fitting specialist to help ensure you are wearing the correct size. Avoid the temptation to get back into your pregnancy clothing, as these pieces are unlikely to do much for your self-esteem. 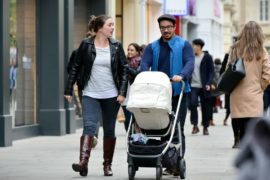 Because you are unlikely to fit back into your pre pregnancy clothes, it is my advice to invest in a few key pieces of clothing during this transitional period. A wrap dress will flatter any figure as it helps to create a small waistline. It is also adjustable so will work with your changing body. Comfortable high wasted jeans with stretch will help to tuck away any extra rolls, giving you a longer leaner appearance. Pretty tops ideal for breastfeeding will give you a feminine edge. Avoid large prints and horizontal strips. Dark Block colours such, as black and navy are flattering along with small prints. Invest in some workout clothing. A simple pair of black leggings, a sports bra, trainers and a comfortable T-shirt should suffice. Having comfortable workout gear will help to make exercise fun and enjoyable and will act as a motivator. Keeping active is not only fantastic for your body but will do wonders for your mental health. However you choose to dress post partum is completely up to you. Everybody’s motivations are different! It is important however to understand that not all women regain their pre-pregnancy body 100% and we should learn to love the bodies we’re in.